The latest release of Sport England’s Active Lives data shows that 4,317,600 (61.8%) Londoners aged 16+ were physically active over the period May 2016 – May 2017, that is they met the Chief of Medical Officers (CMO’s) recommendation to take part in more than 150 minutes of at least moderate physical activity per week. In comparison to the rest of the nation, physical activity levels across London remain slightly higher than average (60.3%). However, current rates represent a slight drop in activity levels from the first release in January which indicated 62.2% pf Londoners were active over the period November 2016 – November 2017. While the current level of data only covers 18 months, and is therefore insufficient for comparison, it does highlight the vast differences in participation levels across London boroughs. At one end, 73.5% of Hammersmith & Fulham residents meet the CMO recommendations, while on the other end only 50.2% of Barking & Dagenham residents achieve the same. There are many factors that might influence these figures from facility availability to income levels, nevertheless, London finds itself in a unique position whereby the extent of disparity and differentiation across local areas highlights the magnitude of the difficulties facing the city as we strive to reach our 1,000,000 more active target. National (England) level data further highlights inequality in participation across gender, socio-economic status, age and disability. Males (63%) are more physically active than females (58%), this disparity increases across sporting activity. However, women are more likely than men to walk for both leisure and travel, and 3x times more women take part in creative or artistic dance than their male counterparts. Across socio-economic groups, people who are classified as NS-SEC 6-8 are almost twice as likely to be physically inactive than people who are classified as NS-SEC 1-2. Continuing the trend, the data highlights that inactivity is more common amongst people with a disability (43%) than those without (21%). Finally, the proportion of people reaching 150+ minutes of physical activity decreases exponentially with age as half of all inactive people are aged 55+ despite that age group making up only 36% of England’s adult population. In addition to releasing the 2nd report on physical activity levels, Sport England also released the first round of data on volunteering levels. Findings highlight that the proportion of Londoners (11.6%) who have taken part in a volunteering role in sport or physical activity at least twice in the last 12 months is the lowest of any region of England, for which the average is 14.9%. 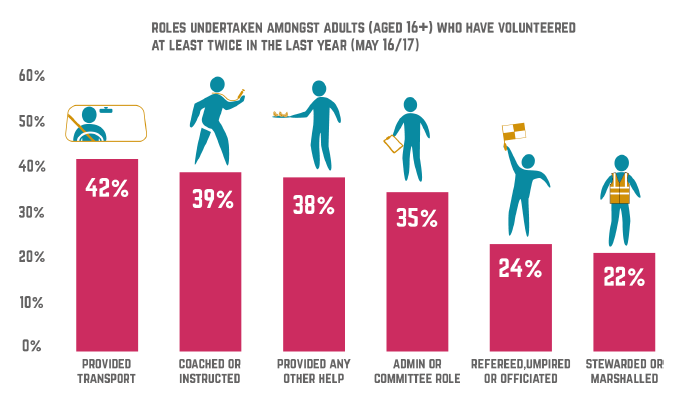 The data further indicates that men (60%) are more likely to volunteer than women (40%), while those aged 16-24 and 45-54 are the most likely age groups to be involved in a volunteering role in sport or physical activity. Broken down by Borough, residents of Kingston upon-Thames (21.6%) and Brent (20.3%) display higher volunteering levels than any other borough. On the other hand, residents of Barnet (7.7%) and Greenwich (7.8%) are the least likely to have been involved in any physical activity or sport volunteering activity. Overall, it is worth noting that while the data remains limited, it highlights the need for support across London and further identifies areas where we can increase the positive impact of our work as an organisation. Tristan Farron-Mahon is an Insight Officer at London Sport. Tristan is an expert in local area data analysis and interpretation for the purpose of creating new understanding to support the development of physical activity and sport across London.